Wow, I've done 31 of these? Rich Gedman is a catcher who played for the Pawtucket Red Sox mostly in 1980, with a few '81 games and like 4 games in 1988, which was the future. In 1980, Gedman played in 111 games. He was 20 years old. He hit two triples and struck out a lot. His manager was Joe Morgan. Every time he tried to walk away, something made him turn around and stay. Gedman had 21 passed balls the previous year in double-A, but only six in his first triple-A season. Good work! Oh, and Gedman hit eleven home runs that year. All of them off Michael Bowden. The next season, Gedman appeared in 25 PawSox games. Suddenly he was on top of the world. Gedman walked nine times and batted .296. Hmmm, what else happened in at McCoy Stadium in 1981? Yes, it was the Longest Game in Baseball History, and Rich Gedman caught the first nine innings! Alright, Hamilton! During Gedman's four game Pawtucket stint in 1988, he went 7-15 with a double and a towering home run to right. He mostly DH'd. 1. During Gedman's first Pawtucket season, he led the International League catchers in doubles and assists. 2. Gedman caught Bruce Hurst. DONE! 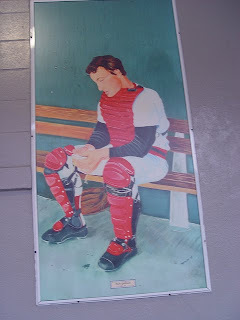 Rich Gedman's mural hangs in the upper part of the first base tower. Thanks again to Lil' Rhody Dan for allowing me to use his mural pictures. Yesterday's IronPigs (one word) game, moron. 4.21.11 Pawtucket Red Sox in Rochester. I didn't even wish on a morning star.